If you take a look around the web, the Content Management Systems you will find allow you to just edit your content, maybe an image can be placed and bold some text. Our content editor is not only full featured, but we have over 30 mini-apps that plug into it, including an Appointment Calendar, Blog, Testimonial Generator, and Banner Manager, to name a few. Plus, there’s no downloading and installing, so there’s no potential for getting confused or stuck going back and forth with technical support. Click here to read more. Below you’ll find our pre-defined packages that cover most types of clients. After your customer’s website and needs are analyzed, you can easily come up with a package and any necessary customizations using our quote generator without needing to wait for our response, or ask us and we’ll help you with the quote. This package is the most affordable way for retail businesses to have a web presence without the extra cost of a full-fledged product website. It allows all the other features one would expect from a retail website, such as social networking integration, SEO Management and newsletter signups. As always our CMS allows for unlimited page creation, so product pages can be added on the fly as needed. More and more potential customers are using smart phones every day. Web usage by mobile users increased by 149% in 2009 alone, and yet many businesses don’t think of implementing mobile-friendly sites. Instead, they force visitors to zoom in and drag the site around the screen to get the info they need. Gain the edge by making a dedicated mobile-friendly website available to your customers, so they can modify its content as well as their own with our CMS. Want to offer a blog to your customers? We have that covered, too. Just add it to any package and we take care of the rest. Silvermoon Interactive’s blog seamlessly integrates with our CMS as we built it from the ground up, and yet has all the necessary features of any typical blog out there. We’ve kept it easy to use and quick to add/edit/delete posts and comments, so your customer can maintain their blog and move on with their day faster. These small web and software applications make up our Silvermoon Interactive Mini-App Suite. If you choose an a la carte solution, below is our entire list of mini-apps so you can create your own custom package. We are creating new mini-apps with almost every project, so if nothing jumps out at you, just let us know and we’ll create a custom web application solution to satisfy your needs. Our eCommerce system seamlessly plugs into our Mini-App Suite to give you not only shopping cart and checkout abilities, but reporting on sales and inventory. This goes hand & hand with our Products and Categories Mini-App for a full featured e-tail website. The Photo Gallery allows you to upload and manage photos for your visitors. This Mini-App automatically resizes any image you upload and places a thumbnail and full size image int he right place. Restrict the galleries to your members, or make it viewable by everyone. Uses Lightbox to display the slideshow. Integrate your favorite message board into your website, with the same look and feel and using a single login. Our Body Mass Index Calculator is very popular with healthcare industry websites, as well as sports and recreation to raise awareness of obesity in America. This Mini-App is our first free application, and gives your visitors easy access to BMI information by instantly showing their BMI by plugging in a few numbers. Click here if you want to install it independent from our other services. The Testimonials Mini-App can display customer Testimonials in several different ways. From randomly cycled quotes on any one or more pages of your liking, to a list format similar to FAQ's, or with pictures in a grid of each person. These are just a few examples of how we tailored Testimonials to our clients in the past. This Mini-App will allow those with large product databases to add or make changes to a large group of products. The Bulk Product Uploader seamlessly integrates with our Products and Categories and eCommerce apps to make for a complete and easy way to get your products online. SiteSearch is the Mini-App we employ when you would like visitors to search the content of your website. You may use our search engine or we can switch to using a third party, such as Google. Our Image Manager lets you manage all your images on any page by uploading them into a queue box. The Drag & Drop part means just that, drag and drop them into a predefined area and arrange them to your liking. Need to add more pages to your site? Just open up the Navigation Editor and in a few steps you have a new page. Add a landing page by simply typing your desired URL and edit away. Take control of your navigation with this Mini-App. Does your website need a member's section? Not only does this Mini-App allow for that, but you can also manage every aspect of each member in the admin section of your website. Add our Appointment Calendar, Photo Gallery or other apps to round out your members section. Plug this into your site to give it Social Networking abilities. Send and receive messages, view profiles, and multimedia to keep them coming back. We created our own blog to seamlessly integrate into our Mini-App Suite, since all the third-party solutions were either too simplified or too complicated. It can offer all features of the average blog software as well, so you're not missing anything. Upload and manage your banners on any page. Display them randomly on every page view, or rotate through them like a slide show. Our Searchable Directory Mini-App allows you to display a full directory of people or businesses alphabetically, by category, etc. It also allows any visitor to easily search through this directory. Keep content fresh on your website with our SideBar Rotator. Use our Mini-App to store events, testimonials, profiles, food dishes, or any theme you can think of with a photo and text. Those items will then randomly rotate each time a visitor comes to your page providing an elegant way to discover what your company can offer and keep them coming back for more. Give your website visitors a place to ask for and read advice. Receive notifications when requests are made. Our mini App will store pending questions and allow you to edit the question if necessary, post answers and decide which to share on your website. Our SmartFollow Jump Menu gives your visitors quick access to user-defined sections of the page. As they scroll down, the side menu follows them. This allows you to add more content to any single page as needed. The Newsletter Mini-App not only allows you to send your HTML or plain text Newsletter to your email list, but it also hosts an online version. You can format your Newsletter using our Content Management System editor, which is similar to any major word processor. Edit Meta Tags on any page with our Meta Tag Editor. Set defaults in the admin section, and set custom descriptions, keywords, or titles on each page of your website. If you just want to show your products and allow buyers to come in to purchase, this is the Mini-App for you. It includes listing products by category, popularity, brand, and type. You can also create your own group of products and create landing pages. As with all our Mini-Apps, it's all manageable by you in the Admin section. This works very well with the bulk product uploader for those with many products to manage. List events per month with a purely informational purpose, or allow members to register for them. Allows for recurring events, displaying the data in other formats, and exporting to any major calendar application. Optionally, you may limit to a certain number of available spots, and allow users reserve seats for their guests. Our Frequently Asked Questions Mini-App makes managing your FAQ's quick and easy with zero HTML knowledge required. Our ScreenFade Video Manager enables you to upload and post videos on any page. It fades the visitor's screen and focuses attention on the video itself. This is what we use for all our clients interested in displaying videos on their sites. Our Press Mini-App will take care of all the press releases on your website. Add, Edit, Hide or Delete as needed, and even link it to a downloadable PDF. 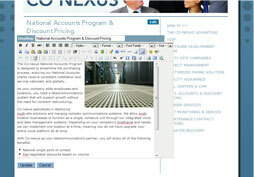 Compose your press releases on our CMS editor, which is just like any word processor. Place this widget anywhere on your website, providing your visitors a way to share their email with you. Email addresses are then stored and available for export any time. Use to send out newsletters, product updates, or promotional mailings. Includes an unsubscribe feature for CAN-SPAM Act compliance. Menus are one of the most important parts of your food service website. Our Editable Menus Mini-App gives you the ability to add, edit, delete, and add pictures to your menu. You are in control of your menu, and can change it at any time to keep up with your changes. Our Store Locator integrates with Google Maps, allowing your visitors to enter their city or zip code and be taken to a map seamlessly integrated into your site. With pinpoints and a customizable description of each of your locations, you can provide phone numbers, store hours and links that are tied to each location and listed along the side of the numbered map. Give your customers a simple user friendly and familiar way to find your stores without leaving your website. The Intranet File Manager is a back-end tool allowing users to post company documents and files in a central location accessible anywhere there is an internet connection. Great for franchises and companies with multiple locations. Perfect for distributing training materials, employee forms, manuals, etc to store managers and other employees.